With the arrival of colder weather and shorter days, cooking and baking is more appealing than ever. Maybe it’s the instinct to stockpile before going into hibernation, or finding something comforting to do indoors or maybe it’s the slight slowing down of life that allows for a little more personal indulgence. Whatever the reason, preparing hearty meals with seasonal foods is one of my favorite things to do this time of year. 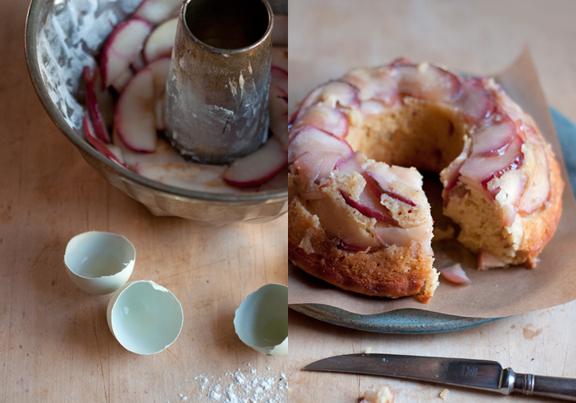 Above is an apple cake I made last weekend, loosely based on this recipe. 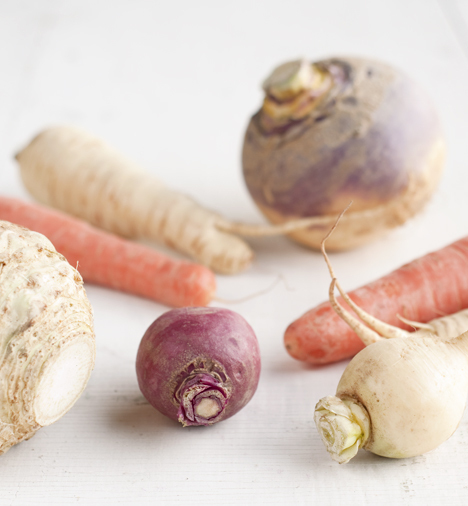 Here are some root vegetables—purchased at one of the last outdoor farmers’ markets of the season—that were begging to be photographed in all their gorgeous, gnarled glory. This week they will be made into soups, mashes and salads. Thank you Fishbowl Farm and Green Spark Farm for this lovely assortment of fall veggies. In this season of thanks, I am particularly thankful to live in a place where we now have year-round access to locally grown and raised food. In addition to the Portland Winter Farmers’ Market, a collection of local farms will be organizing weekly pick ups of winter offerings as long as supplies last. It’s always such a let down to have to go back to buying vegetables at the supermarket come winter, so being able to buy all but a few select veggies from local providers is a relief. A big thank you to all the farmers who work so hard to bring us healthy, fresh food year round. Happy Thanksgiving everyone! This entry was posted in food and tagged apple cake, Fishbowl Farm, Green Spark Farm, Portland Maine Winter Market, root vegetables on November 22, 2010 by Stacey Cramp.